The Gospel of Judas portrays Judas as the foremost amongst the disciples, the only one capable of fully understanding Jesus' teaching. It also contradicts the orthodox idea that Judas betrayed Jesus. Instead, the Gospel of Judas seems to state that Judas surrendered Christ to the Romans at Jesus' direction. But since the publication of the original Coptic text of the Gospel of Judas a firestorm of controversy has erupted. Coptologist and biblical scholar April D. DeConick did her own translation and found some serious errors in the original National Geographic translation. According to DeConick's translation, Jesus condemns Judas as a demon. Now we are faced with two versions of this text; one portrays a "good" Judas and another portrays a demon. Academia is lining up behind DeConick, and accusations of fraud are being hurled about the normally staid community of Coptic scholars. This Judas was not only the most faithful and devoted of all the near followers of Jesus Christ, but also, only thanks to his Reason and presence of mind all the acts of this Sacred Individual could form that result, which if it did not serve as the basis for the total destruction of the consequences of the properties of the organ Kundabuffer in these unfortunate three-brained beings, yet it was nevertheless, during twenty centuries the source of nourishment and inspiration for the majority of them in their desolate existence and made it at least a little endurable. 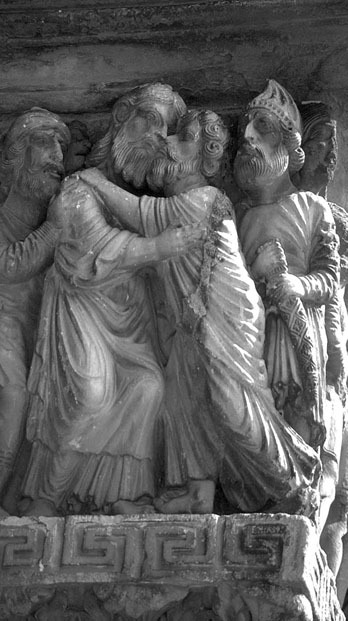 However, in light of the controversy over the translation, the concordance between the Gospel's contents and Gurdjieff's teaching on Judas would appear to be in question. But before delving into the debate over the translation of the original Coptic text it would be useful to take a look at this debate's academic context. For while there is disagreement between scholars about the translation of certain words, writers on both sides of the issue seem to agree on certain assumptions about the Gnostics, specifically the authors of the Gospel of Judas, the Sethians. While each scholar attributes a slightly different motive to the authors of Judas, they generally agree that the overarching aim of this Gospel is a refutation and rebuke of "official," or apostolic, Christianity. For instance, DeConick views the discussion between Judas and Jesus as, "a fictionalization of an authentic historical dialogue in which the Sethian Christians were engaged with the apostolic Christians." Elaine Pagels, the most well-known author on Gnosticism and a Gnostic apologist, interprets the main theme of the Gospel of Judas as a Gnostic argument against apostolic Christianity's veneration of martyrdom, thus giving the Gospel of Judas relevance to current events. Gesine Robinson, in what seems to be a postmodern interpretation, describes the Gospel of Judas as "full of irony" before dismissing it, and all of the other Gnostic texts, as only useful for understanding the "battles that were raging" during the early days of Christianity. Even the canonical Gospels are viewed in this context, with DeConick arguing that Mark was writing to undermine the authority of the 12 apostles. The general assumption this group of scholars adheres to is that one of the primary aims of all early Christian writers was to vie with opposing sects for doctrinal supremacy. As Pagels sums up this assumption: "The traditional history of Christianity is written almost solely from the viewpoint of the side that won, which was remarkably successful in silencing or distorting other voices, destroying their writings, and suppressing any who disagreed with them as dangerous and obstinate 'heretics.'" Her view is that the New Testament was composed and compiled by those who had won the sectarian struggle and, "what the Gospel of Judas implies: [is] that only those who misunderstood and rejected Jesus's [sic] teaching were left to carry on after his death. The only hope of rectifying this situation lies in the secret account of Jesus' teaching from the Gospel of Judas itself!"